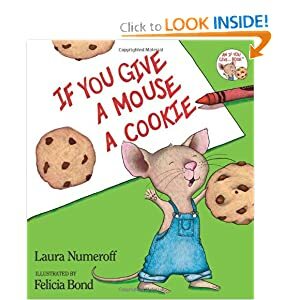 Our book today was If You Give a Mouse a Cookie by Laura Numeroff. We have had stomach flu in our house for the last couple of days but it seems to finally be gone. I decided we should celebrate by making cookies! We just used the recipe on the Nestle chocolate chip bag. Aubrey is ready to begin! and helped stir the dough. When the dough was ready, she filled the cookie sheet with cookie dough balls.